Oh wow, those Pixar people really did their research. So, back to Sylvia Earle. She is amazing. HUHHHH-MAZING. She is also completely under-known, under-rated, under-appreciated. She is a kickass boss woman marine scientist who headed NOAA (pow pow! ), has logged thousands of dives (kaplow! ), and now fights for the ocean's right to live, LIVE, LIIIVE. She wrote the wonderful The World Is Blue, delivered a TED talk, founded an ocean conservation org and is both inspiring and fascinating. 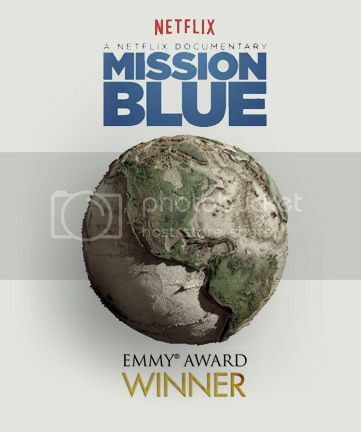 Mission Blue, a documentary (on Netflix!) by Fisher Stevens (where do we know him from? ), follows the evolution of Sylvia Earle from beach-going Florida kid scientist to marine eco-warrior. There's a scene reminiscent of Greenpeace-style activism where Earle, in her late 70s, dons a wetsuit and jumps into the water near a fishing boat. The fishermen - all men - are shouting at her and the other cameramen, and she swims up, taking pictures, filming, as the giant industrialized fishnet pulls an entire school out of the ocean. It's amazing - horrible - inspiring. WHERE DOTH MY WET SUIT GO, I SHALL JOIN THEE! Another moment in the doc notes that Earle never recognized or acknowledged the glass ceiling. She just did what she did. And, indeed, there's a refreshingly straightforward directness to her. Never is the F-word (feminism) uttered, but her entire life is testament to it: she wanted to do science, dammit! Now she wants to goddamn save the whales! AND SAVED THEY SHALL BE. Another jarring moment: when Earle wanders the Tokyo fish market. It's the exact same shots as in Jiro Dreams of Sushi, except now our perspective is radically different: rather than the hedonistic, aesthetic appreciation of all that fine, dead fish, we have Earle's tortured gaze at all that over-fished, unsustainable, dead fish. The scenes with the shark fin hunting - where fishermen sliced fins from still-living, writhing sharks and threw them, gushing blood and panicky, back into the water - left the PPCC shaken, horrified. We loved this documentary, and it's important, and we thought about it for days afterward. But we're already converts: 30+ hours at depths between 15 to 30 meters will do that to you. Will it appeal to the proto-eco-warriors out there? To those that have yet to have their "this blue planet!" peak experience? We don't know. But we do think Earle should be celebrated as the special, inspiring lady she is. Into the hall of heroes you go, Sylvia!